J.F. Mustard, R.L. Kinlough-Rathbone, and M.A. Packham, Isolation of Human Platelets from Plasma by Centrifugation and Washing. S. Timmons and J. Hawiger, Isolation of Human Platelets by Albumin Gradient and Gel Filtration. B. Rucinski and S. Niewiarowski, Isolation and Characterization of Porcine Platelets. J.L. Catalfamo and W.J. Dodds, Isolation of Platelets from Laboratory Animals. K.S. Sakariassen, R. Muggli, and H.R. Baumgartner, Measurements of Platelet Interaction with Components of the Vessel Wall in Flowing Blood. G.L. Fry and J.C. Hoak, Measurement of Platelet Interaction with Endotheliel Monolayers. A. Eldor, Z. Fuks, R.F. Levine, and I. Vlodavsky, Measurement of Platelet and Megakaryocyte Interaction with the Subendothelial Extracellular Matrix. K. Park, D.F. Mosher, and S.L. Cooper, Ex Vivo Measurement of Platelet Adhesion to Polymeric Surfaces. J.N. Lindon, L. Kushner, and E.W. Salzman, Platelet Interaction with Artificial Surfaces: In Vitro Evaluation. M.B. Zucker, Platelet Aggregation Measured by the Photometric Method. M.M. Frojmovic, J.G. Milton, and A.L. Gear, Platelet Aggregation Measured in Vitro by Microscopic and Electronic Particle Counting. K.M. Brinkhous and M.S. Read, Use of Fixed Platelets in Agglutination/Aggregation Tests. 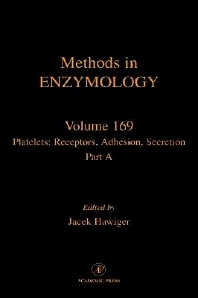 D. Bessman, Determination of Platelet Volume and Number. W.A. Heaton, A. du P. Heyns, and J.H. Joist, Measurement of in Vivo Platelet Turnover and Organ Distribution Using 111In-Labeled Platelets. J. Hawiger, Platelet Secretory Pathways: An Overview. H. Holmsen and C. Dangelmaier, Measurement of Secretion of Adenine Nucleotides. H. Holmsen and C. Dangelmaier, Measurement of Secretion of Serotonin. H.N. Antoniades and P. Pantazis, Platelet-Derived Growth Factor: Purification and Characterization. J.C. Holt and S. Niewiarowski, Platelet Basic Protein, Low-Affinity Platelet Factor 4, and ~gb-Thromboglobulin: Purification and Identification. R.M. Senior, G.L. Griffin, A. Kimura, J.S. Huang, and T.F. Deuel, Platelet ~ga-Granule Protein-Induced Chemotaxis of Inflammatory Cells and Fibroblasts. M.F. Lopez-Fernandez, J. Batlle, Z.M. Ruggeri, and T.S. Zimmerman, Secretion of von Willebrand Factor from Platelets. H.S. Slayter, Secretion of Thrombospondin from Human Blood Platelets. L.L.K. Leung, P.C. Harpel, and R.L. Nachman, Platelet Histidine-Rich Glycoprotein. A.H. Schmaier and R.W. Colman, Platelet High Molecular Weight Kininogen. E.F. Plow, L.A. Miles, and D. Collen, Platelet ~ga-2 Antiplasmin. J.J. Sixma, J-W. Slot, and H.J. Geuze, Immunocytochemical Localization of Platelet Granule Proteins. C.L. Berman, E.L. Yeo, B.C. Furie, and B. Furie, PADGEM Protein. H.S. Slayter, Dark-Field Electron Microscopy of Platelet Adhesive Macromolecules. H. Holmsen and C. Dangelmaier, Measurement of Secretion of Lysosomal Acid Glycosidases. L.F. Brass and S.J. Shattil, Interaction of Extracellular Calcium with Surface Membrane of Human Platelets. L.F. Brass and E. Belmonte, Calcium-45 Exchange Techniques to Study Calcium Transport in Intact Platelets. P.C. Johnson, J.A. Ware, and E.W. Salzman, Measurement of Platelet Cytoplasmic Ionized Calcium Concentration with Aequorin and Fluorescent Indicators. Biochemists, cell biologists, hematologists, pharmacologists, physiologists, and neurochemists.